Thankfully, living in Southern California means that I’m never far from a fish taco. But if I was, life would still be a-ok because fish tacos are one of the easiest things on the planet to make. I don’t mean the naked kind, a.k.a the “grilled” fish taco. I’m talking about the crunchy beer battered fried taco, which I know is probably not as healthy as the grilled version, but lives can be changed when you bite into that crispy batter and the hot flaky fish hits your tongue. When I saw some Copper River Salmon at my local Costco going for an awesome price, I threw some in the cart stat! Normally I’d use halibut for fish tacos but salmon tastes just as good, and it’s packed with healthy oils which probably sadly vanish when it hits the fryer. 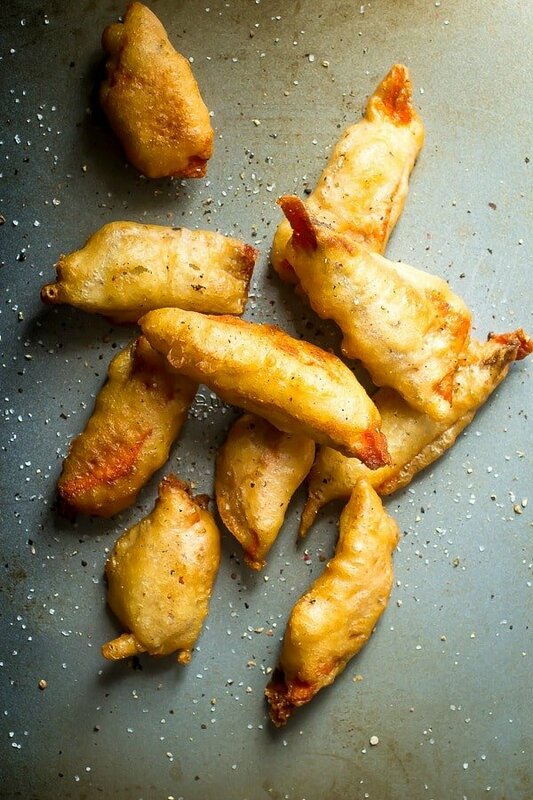 But remember the crispy batter guys, that’s all we need to focus on right now, crispy crunchy batter. The other ingredients couldn’t be simpler. Tortillas – corn and charred. Cilantro – fresh and lots of it. Avocado – because it’s California! So how does fish tacos once a month sound? Just one or two…maybe three because those tortillas are on the dinky side. More incredibly delicious fish tacos from people who think like me! 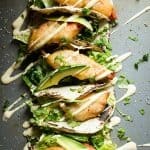 Crispy beer battered salmon tacos with fresh greens and avocado sour cream. Heat the oil slowly in a deep pot until it reaches 380 degrees, measured using a thermometer. Place one half of the avocado into a blender. In a bowl, combine the flour and the beer and whisk until smooth like pancake batter. You may need to add a little more beer if needed. Cut the salmon into strips about 2 inches long. You should get about 9-10 pieces. Once the oil is at the correct temperature, place a large plate lined with paper towel close by. Dip the fish into the batter and then gently drop into the hot oil. You may need to do 2-3 pieces at a time to prevent the oil boring up too high. Cook the fish for about 1 minute per side or until the batter is golden brown. Keep an eye on the oil temp as it'll fall when you add the salmon. Transfer to the paper towel to drain and repeat until all of the fish has been cooked. Once all of the fish has been fried, season lightly with more salt and pepper. Place some of the romaine on top of a tortilla and top with a piece of fish. 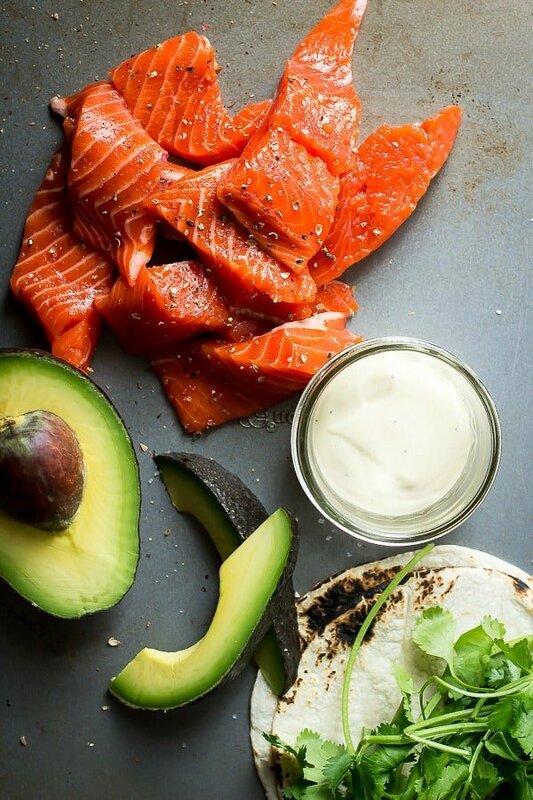 Slice the remaining avocado and top each fish taco with a slice of avocado. Drizzle some of the sour cream over the tacos and garnish with lots of chopped cilantro. You can char your tortillas over a gas flame. They will burn fast so don't walk away and use a pair of tongs to turn them over when each side has started to become black around the edges. One of the best things about living in So Cal is the plethora of fish tacos. I picked up the Copper River Salmon from Costco too, had it grilled last night but I think I missed the bill and should have made these instead. Guh. I’m about to expire from lack of fish tacos. It has been way too long. My husb and I shared a plate of salmon fish and chips one time and I was fairly knocked out, so I really ought to give these tacos a try. Especially with that avocado sauce. Well done! What epic tacos, love the crispy salmon! I’m absolutely loving the flavor combination and look of these, I’m going to add these to my mealtime menu for next week! LOVE these! 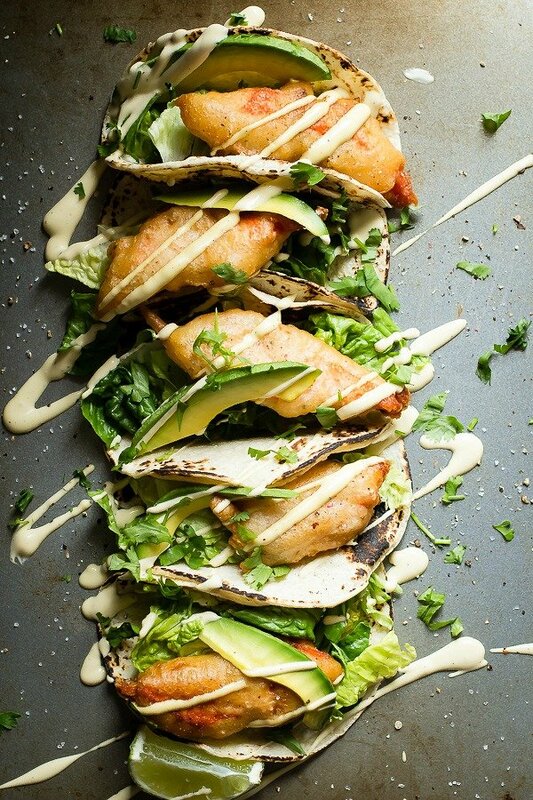 Brilliant spin on Fish Tacos..must try! Was kann ich statt den Bier nutzen! ? 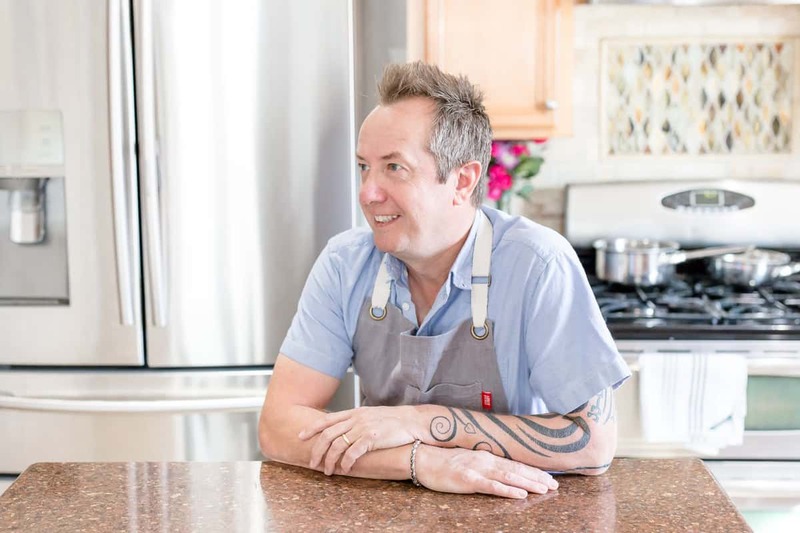 So far it’s been a 100% win on every recipe I’ve seen on your Blog! The Tacos are a sure winner! just made this. is easy, fast & very yummy. no fat, just fish, no fishy taste or smell. my husband who isnt a big fan of fish like this so much. Awesome Ann, one of my favs! !